Dwight Eisenhower spent much of his presidency dealing with the “Communist Menace”, both real and perceived. 1954 was no exception. Nasser seized absolute power in Egypt, home to the Suez Canal, and immediately aligned the country with the Soviet Union. Nasser threatened to nationalize the canal and a world crisis was anticipated but diplomatic maneuvers delay the showdown until 1956 when Eisenhower actually sided with the Soviets after the French and British went to war with Egypt over the canal. However another showdown with the communists in 1954 had dramatic repercussions for the United States. Ho Chi Minh’s Viet Minh nationalist forces surrounded thousands of French legionnaires at Dien Bien Phu near the Laotian border with Vietnam which was still occupied by the French. The French pleaded with Eisenhower to intervene to support the French and save Dien Bien Phu but Eisenhower wisely refused. There were even discussions of using atomic weapons to repel the Viet Minh. Finally Eisenhower agreed to transport French reinforcements to Vietnam but this was too little too late and Dien Bien Phu fell to the Viet Minh, the French withdrew from Indochina and Vietnam split into North and South Vietnam late in 1954. By the early 60’s Eisenhower’s sage decision to stay out of Vietnam had been reversed with disastrous consequences for the United States. In this country Joseph McCarthy, chairman of HUAC was finding Communists under every rock and bush. The House Un-American Activities Committee (HUAC) had extended its reign of terror from Hollywood to purges in the State Department and had worked the country into such a fervor that the Congress passed legislation outlawing the Communist Party. Finally McCarty went too far when he decided the U.S. Army too was crawling with commies, even casting suspicion on Eisenhower. The Army general counsel John Welch fought back and attacked McCarty with his famous rejoinder during a HUAC hearing “Have you sir, at long last, no sense of decency?” Congress and the country had had enough and McCarty was censured by the House. In 1954 the Supreme Court decided in Brown vs The Board of Education that “separate but equal” education was unconstitutional, the U.S. launched the world’s first nuclear submarine, the Nautilus and RCA marketed the world’s first color television for $1000- it had a 12 inch screen. WLBZ Bangor came on the air as did Walter Cronkite. On the world’s first transistor radio it was possible to listen to Elvis’ first recording. William Holden and Audrey Hepburn were the best actor and actress and From Here to Eternity was the best picture. Ernest Hemingway won the Nobel Prize for literature and JR Tolkien published volume 1 of his Lord of the Rings trilogy- Fellowship of the Ring. In sports Hank Aaron hit his 1st homer and Roger Bannister broke the 4 minute mile. Sam Snead won the Master and the Yankees set a record by using three pinch hitters in one inning and they all managed to strike out. In Southfield Michigan the country’s first shopping mall opened where it was possible to buy the first TV dinners and first drip coffeemaker. In the St Croix Valley living rooms were being rearranged to accommodate a rather large and heavy wooden cabinet containing a video screen smaller than one on which you may be reading this email. The TV was coming of age and for many years the strongest signal in the valley came from St John. CHSJ- Channel 4- began broadcasting in the spring of 1954. Many of us grew up on CBC television and were none the worse for it as Bangor stations were often hard to get. True, as Channel 4’s April 1, 1954 schedule above shows in the beginning the test pattern was the featured entertainment most of the day and often either the sound and/or the picture would be fade in and out but this soon changed as transmitters were upgraded. The CBC news in those day was only 10 minutes- 7:00P.M. to 7:10 PM. and wouldn’t that be a relief today. 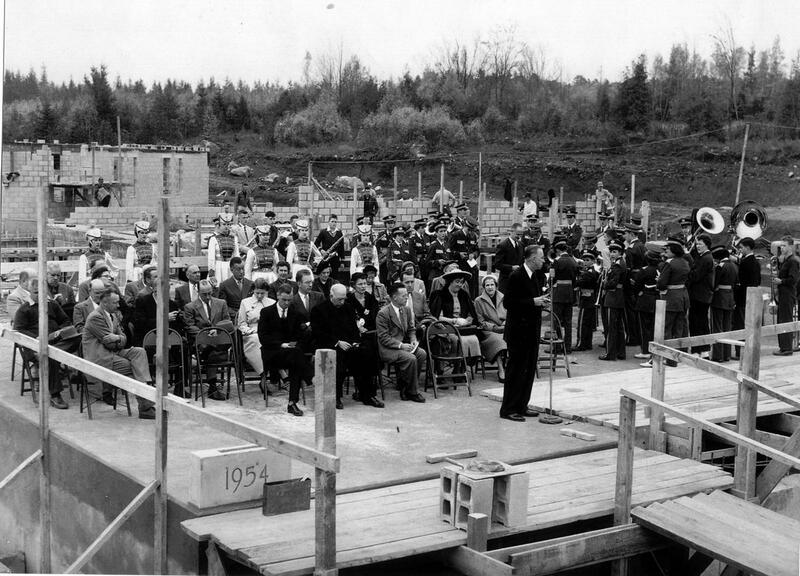 The cornerstone for then “New” Calais Hospital on Franklin Street was laid in 1954 in a ceremony at the site. The Calais Band played and many dignitaries made speeches. We can identify only a couple of the band members- Bill Townsend on trombone and Ora Berry without a uniform in the back row. Neither had uniforms as they were freshmen. 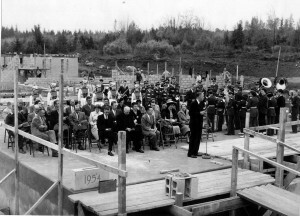 The hospital opened in 1956. 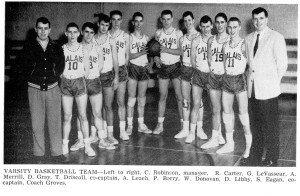 The Calais basketball team in 1954 had a good season and were successful at the Washington County tournament in Machias. 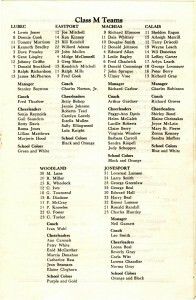 Most of the local schools in those day were “M” medium size schools, even Lubec. 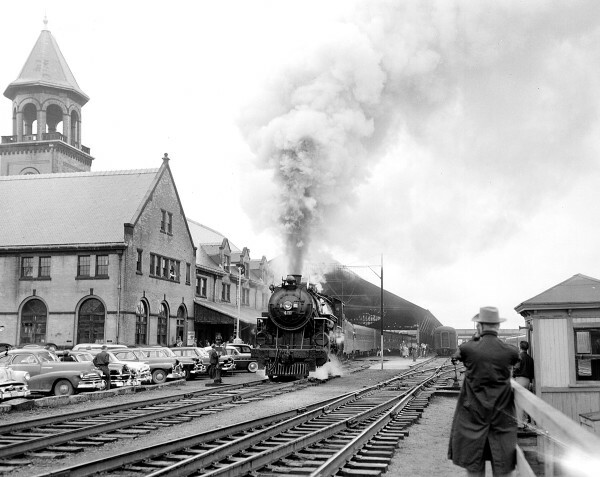 In the photo above taken in June 1954 steam locomotive 470 chugged into Union Station Bangor marking the last visit to Bangor of a Maine Central steam train. 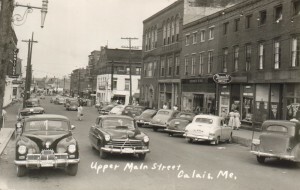 In 1954 the Calais train station was still a busy place although the automobile was quickly cutting into the passenger traffic and trucks were becoming competitive in hauling freight. The old steam engines had been replaced entirely by diesels by the mid 50’s even in Calais. 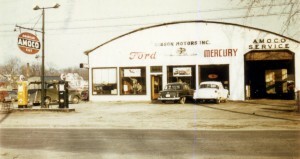 Speaking of the automobile, the first auto dealership to move off Main Street in Calais was Gibson’s Ford Mercury dealership shown here on North Street in 1954.The Machias Savings Bank now occupies this site. Gibson Motors was originally in the building now occupied by Peabody Insurance on Main Street. In the early days a prospective buyer would order a car from the dealer who would place the order at the factory. Several months later it would arrive by train at the Calais station. 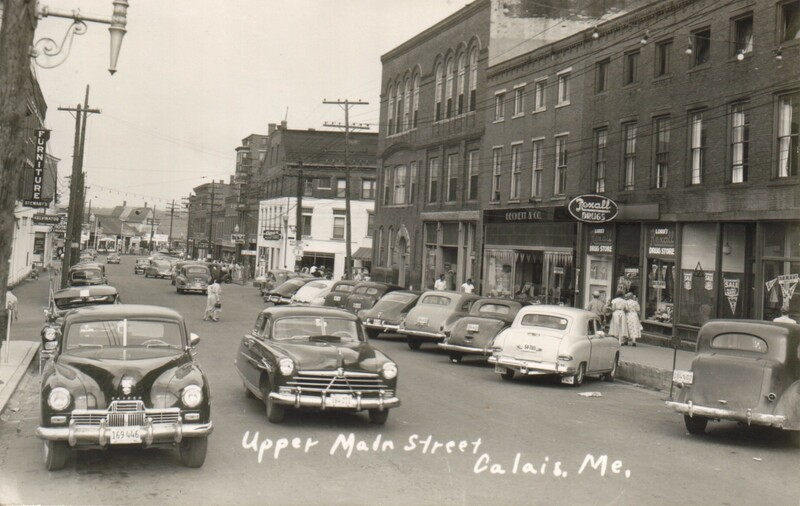 By the early 50’s the marketing people realized they would sell more cars if the dealers had them on hand and for this they needed larger lots than Main Street could provide. Front: seated from Left: Donna Olsson, Ann Mahar, Sandra Murphy, Norma Casey, June Johnson, Zeena Kinney, Elaine Christakos, Shirley McPhail, Sandra Johnstone, Maybelle Cousins, Melva Perkins and Helen Murphy. 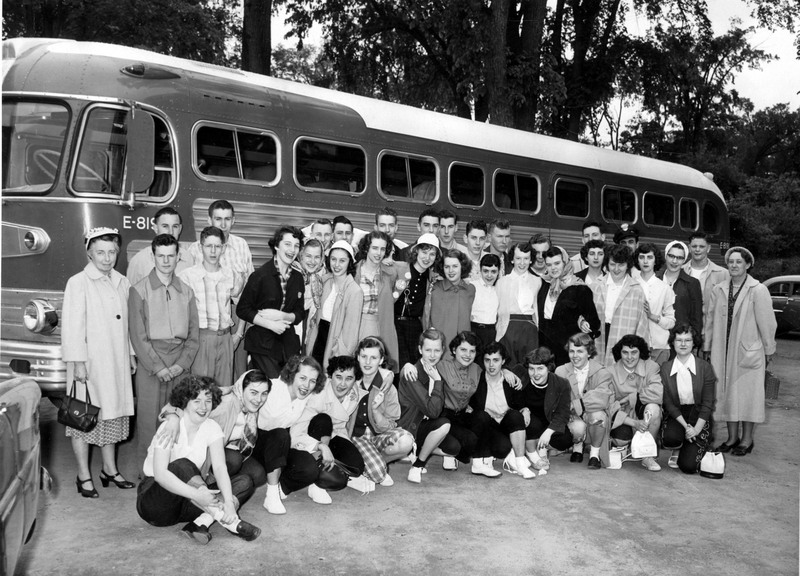 Second row from left: Florence Boone, Maurice Barnard, Gary Frost, Sandra Moffitt, Joyce McLain, Margaret Tapley, Jane Ann Brown, Joanna Scribner, Shirley Bond, Joyce Pike, Freda Worrell, Sandra Hewitt, Jean Chaffee, Florence Wheelock, Joan Chaffee, Yvonne Radway, Mary Boone. 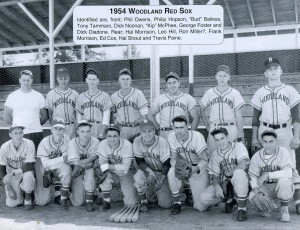 Last row from left: Vose Armstrong, Sheldon Card, Sheldon Eagan, Charles Robinson, Terry Driscoll, Philip Hill, Edward Hiland, Fred Hayward, Leo Main, Donald Donovan, John Allan and John Lawler. The Calais seniors went to Washington DC on their class trip. 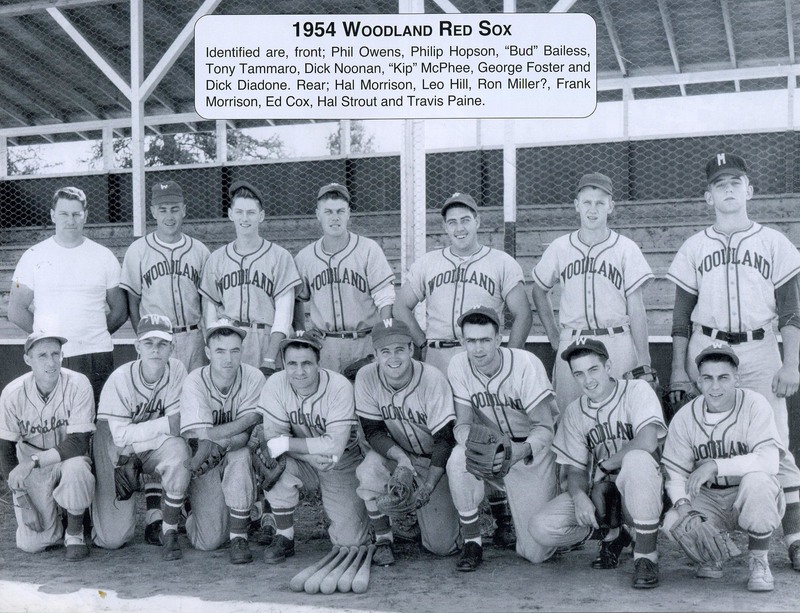 Finally we want to finish 1954 by mentioning one of the best baseball teams to ever take the field in the St Croix Valley- the 1954 Woodland Red Sox. Playing a tough schedule, including some of the best teams in the Maritimes and Eastern Maine, they finished with a record of 33-8. 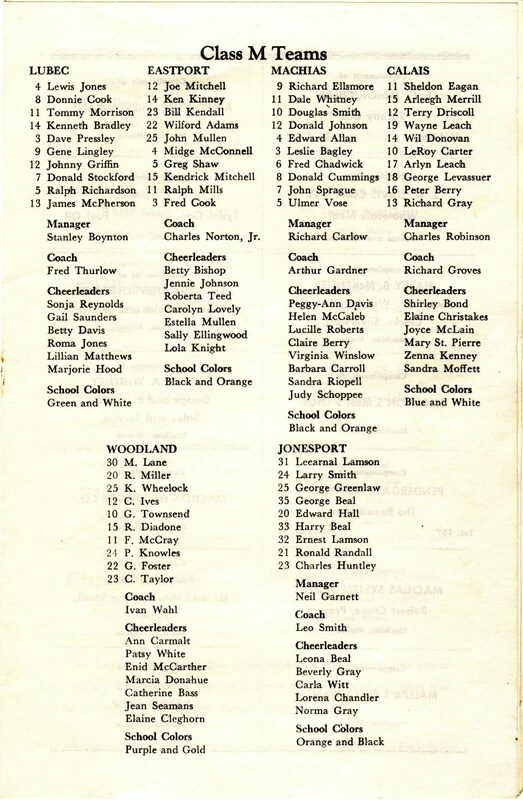 Many of teams they played were stocked, according to Tony Tammaro, the playing manager, with “imported talent”- in other words ringers from Massachusetts or “away”. 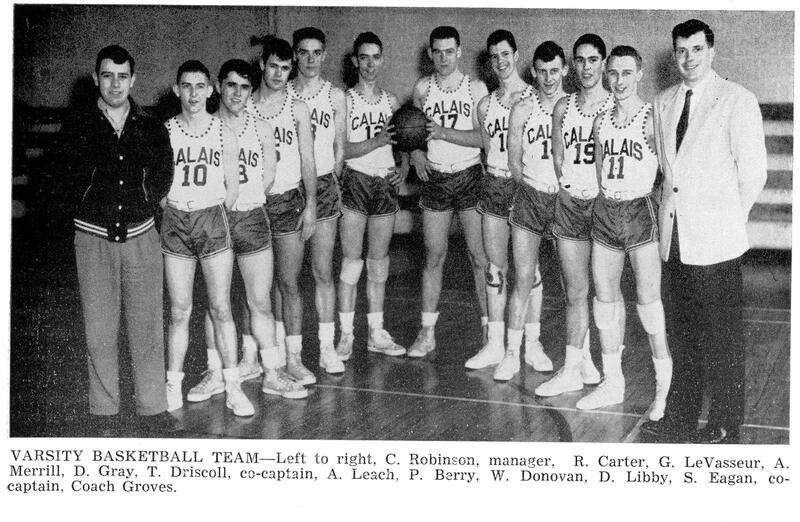 The original 1954 Calais Advertiser article on the team identifies Leo Hill as Louis Hill and Hal Strout as Harold Strout.